Grouping layers helps organize your work and keeps your list of layers uncluttered. You can group selected layers or create an empty group layer and add layers to it. When you group selected layers, they become the sub-layers of the group layer. The first newly-created group layer is named Group. Subsequent group layers are appended with a number. For example, Group_1. The number increments with each new group layer you create. The selected group layer is highlighted in blue and its sub-layers are displayed below. 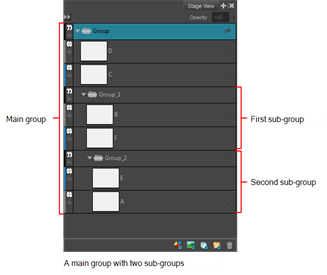 Within a group layer, you can create sub-groups to further streamline your work, and rename them to suit your project. Grouped layers can also be animated. Select two or more layers to group. Click the Group Selected Layers button in one of these areas: Layers toolbar, Layers list in the Stage view, or Layers view. Right-click and select Group Selected Layers. Select Layer > Group Selected Layers. Right-click and select Ungroup Selected Layer. Select Layer > Ungroup Selected Layer. The selected group layer is ungrouped. The group layer disappears and its child layers are no longer grouped. Click the Expand/Collapse button on a group layer. Select Layer > New > Group Layer. A new, empty group layer is created in the list of layers and is highlighted in blue. The new layer is positioned above the layer that was selected before you created the group layer. Drag and drop it on a group layer.